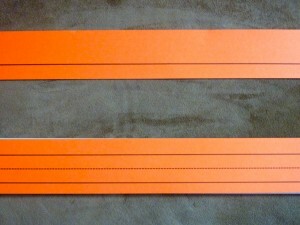 Front and back of sentence strips. As a classroom teacher I would use them to write out sentences provided by the students for our “daily news.” Afterwards we would go back and read what we had written, find words that had certain beginning sounds, words that rhymed, locate proper nouns and verbs. 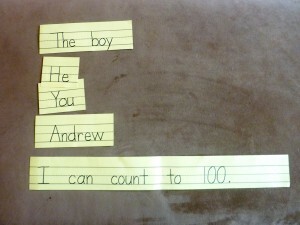 This was such an easy and natural way to incorporate literacy skills with sentences that the children could relate to. Once I began doing My Obstacle Courses with Andrew, I realized that I could do something similar with Andrew by incorporating the same idea into station activities. When I began working with Andrew on putting words together to form complete sentences, I thought it would be best to write about things that he was doing or had done that day. I felt that keeping it extremely relevant to his world would help him figure out if it made sense. I wrote a sentence, cut apart the words and set them out. At first, I placed the first few words out so all he’d have to do was finish it. Eventually he would look at the words, think about what it could say and then placed them together to form a sentence. 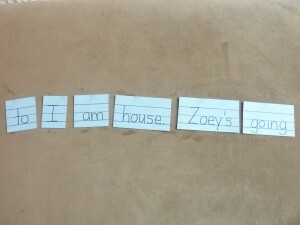 My Obstacle Course Station Activity: Put the words back in order to make a sentence. 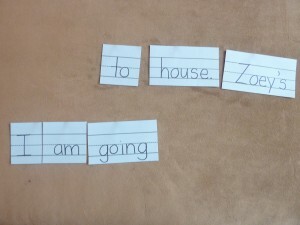 Once the sentence is complete, I can ask him to find words, find words that begin with a certain letter or sound and point out punctuation at the end of the sentence. 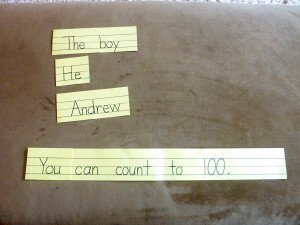 If your child is working on nouns, pronouns or verbs, you could also incorporate those skills! 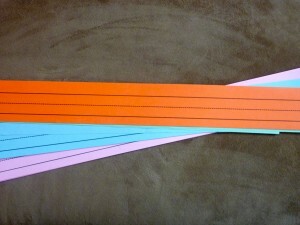 I also used a version of this to work on pronouns. I would write a sentence and then we would place different pronouns over his name to see how the sentence changed, sometimes the meaning stayed the same, sometimes it changed. 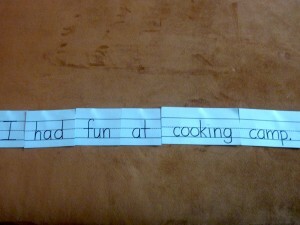 My Obstacle Course Station Activity: Read the sentence. 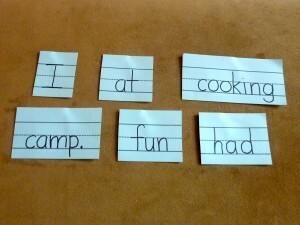 Add the word cards to see if the meaning of the sentence changes. Replacing "I" with "You" in the sentence. 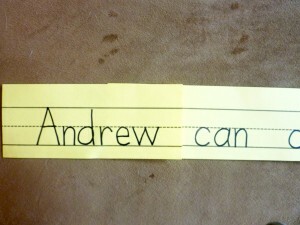 "Andrew" replacing "I" in the sentence. It doesn’t take long to create a sentence that can help your child build and reinforce literacy skills they are ready for. In my experiences while teaching and with Andrew, children like to read about things that are either about them, something they have done or something they are going to do. Because you are doing this with your child, in your home, all of the sentences can be about them! It makes it relevant and purposeful as well as easier to figure out once they hear the words and start thinking, “Oh wait! I know what this could be! !” Those are great moments to witness, with the little smirk on their mouth and an intense look on their face as they work to figure out the correct order of the words. 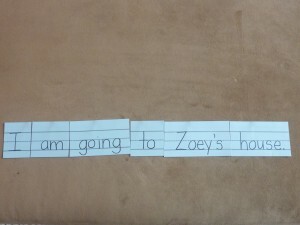 I have some other ways I have used sentence strips in My Obstacle Courses with Andrew and will share those in future posts! Thank you for allowing me to share with you! !